Boil macaroni until almost done. In a mixing bowl whisk together eggs, half and half, salt, and pepper. Spray generously the bottom and sides of a large baking pan. 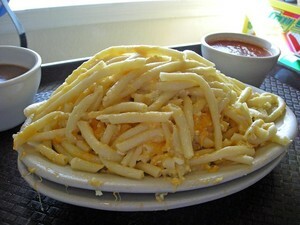 Spread ½ of the macaroni, then sprinkle ½ of the cheese on top. Then layer the remaining macaroni. Pour the milk mixture over the top and sprinkle with remaining cheese. Slice butter long ways and lay on top of the cheese. Bake at 400 for 22 minutes uncovered. Then cover with foil and bake an additional 22 minutes.